SPARCS is truly about sustaining passion, ambition and resolve for career success in the dynamic technology field. Local business involvement is key to helping young people understand and appreciate how I.T. supports business success, the diversity of technology roles and opportunities, and the technical and professional skills needed to become a valued member of today’s workforce. 2018 Aspirations Award honoree Grace Su and her sister Cindy (pictured above) provided an AspireIT Girls' APPspirations 2 week summer camp for girls in grades 4-8 in partnership with SPARCS, Ramsey County Library – Roseville, and NCWIT. During the school-year, SPARCS events are typically free or low cost. Some students may qualify for scholarships to attend summer-time technology camps. The funding to support SPARCS programs comes from financial contributions made by the Minnesota Aspirations in Computing Awards Program sponsors, the Minnesota State IT Center of Excellence, the National Center for Women and Information Technology (NCWIT), and other available sources. While the honorees selected for the Aspirations in Computing Awards (AiC) program is determined by a review and selection committee, participation in SPARCS events is open for any young women with a curiosity and interest in technology. Through participation, many students build their technology awareness and competence and are then inspired to enroll in technology related courses and activities offered at their high school or in their communities. Invariably, some will then apply for a MNAiC award or other forms of recognition that reinforce their growing commitment to refine their information technology (IT) skills. This group of young women from the Twin-Cities and Rochester area pose with BDPA – Black Data Processing Associates program leaders during an annual summer camp taught by Computer Science faculty and students from Winona State University. Special thanks to Target and Best Buy for their financial support to fund youth scholarships. SPARCS hITs a homer with the Minnesota Twins ⚾ on Saturday, October 27, 9:30am – 3pm. Participants will discover how technology drives success from background to foreground at Target field. It’s sure to be Major League event for students with sporting and technology interests. SPARCS 💙 Microsoft in Edina returns this year on Tuesday, December 18 from 8:30am – 1:30pm. 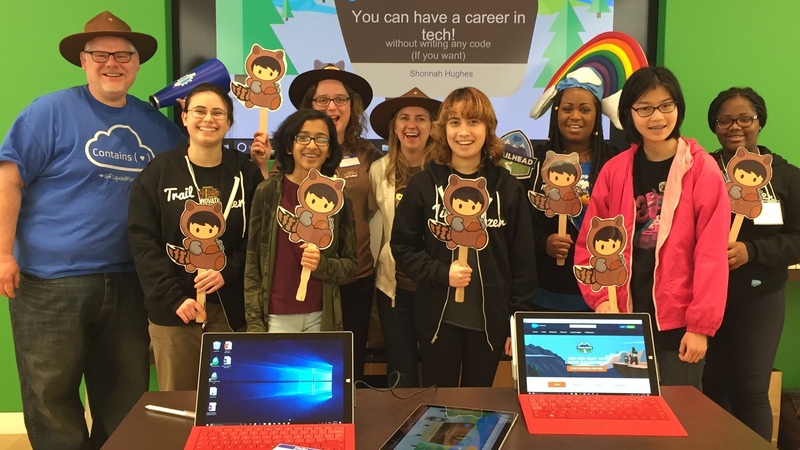 Technology, professional skills building, entertainment, engagement with women in IT, great food and more…. awaits attendees. Aspirations honorees led by Anika Aluwalia (far right) provide a NCWIT funded AspireIT week of summer fun and tech learning at Wayzata High School. Today’s special topic: robotics team fun (see robot 7190 – she rocks!). Have a SPARCS event idea? Let’s get-together and make IT a reality. The SPARCS calendar has openings for special events of various sizes from January through May, 2019. To learn more about SPARCS and the Minnesota Aspirations in Computing Awards programs contact Russell.Fraenkel@metrostate.edu or by phone at 651.253.9438. SPARCS is about Sustaining Passion, Ambition and Resolve for Career Success. This year-round program is facilitated by the Minnesota State IT Center of Excellence and business partners. The program targets middle to high school aged young women and aims to generate excitement about technology education through engagement with information technology (IT) experts in a supportive environment. SPARCS complements the Minnesota Aspirations in Computing Awards Program. Formerly known as Advance IT Minnesota, the MN State – IT Center of Excellence engages employers, educators, technology professionals and learners to develop a more robust IT workforce in Minnesota. A Center of Excellence within the Colleges and Universities of Minnesota State (formerly MnSCU), it is located at Metropolitan State University, St. Paul Midway campus. For more information, visit the IT Center of Excellence.